Denny Jump (Bellevue, WA, United States) on 9 October 2010 in Landscape & Rural and Portfolio. I posted this image today primarily to show some of the key elements of the rocks and vegetation in the park. 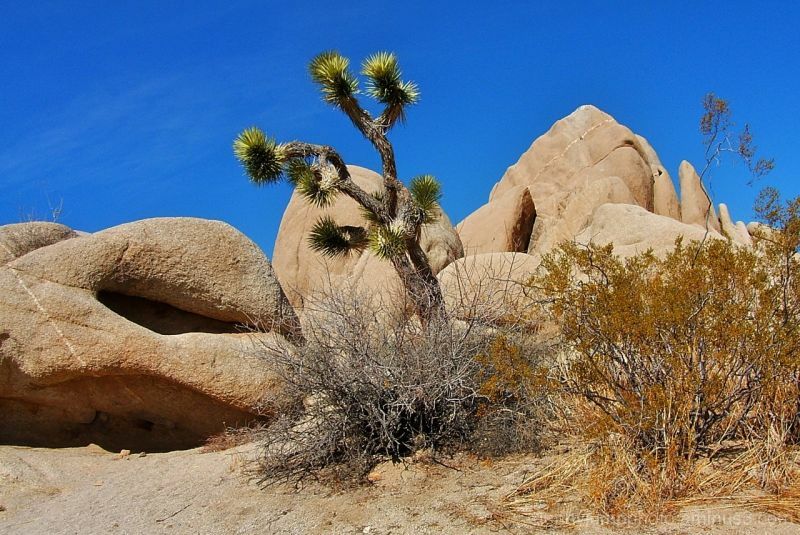 In addition to the Joshua Tree which we have already discussed, there are two other very important desert plants. The plant in the center that appears to be completely "dead" is actually not dead. It is a "Black Bush" (coleogyne ramosissima) and is an important neighbor to the Joshua Tree and other plants and animals. The golden colored bush on the right is the creosote bush (larrea tridentata) This is a very common desert shrub. It has been utilized by the indians down through the ages for various purposes. Now, if you look closely in the rock to the left and the pointed rock in the upper right-hand corner of this frame, you will see lighter colored lines or "veins" running in a somewhat perpendicular line through them. These "veins" are actually quartz. An amazing site is enjoyed, especially in the larger mounds, as these veins of quartz extend, in some cases, for hundreds of yards across and through the rocks. Unfortunately, I have no images of these longer strands of veins, so this will be put on my "to do" list for the next visit. Excellent composition and details in this capture Denny! Also excellent background information. By the way, did the hiker from LA that survived for six day in Joshua Tree NP without food or water, after getting lost, make the news back east. @Bill Brown: Hi Bill - We have been pretty occupited lately bt I don't think much was noted about it...I may have missed it though. I have to say that I am totally unaware of it..that guy is lucky!! The temps out there can still hit 100 easily depending on where you are in the park and the nightime lows can be perhaps even more dangerous...thanks for your really nice comment. That's better - thanks for the info ! @Tamara: Hi Tamra - we made it! I may post a few pics after this series..I am building a stock and also I may drop back my postings a bit..perhaps down to 3 or 4 a week...just too many things going on ya know?? All the best - have a wonderful weekend!! BEautiful image . Great blue sky and that tree is really perfect ! @Mariana Maodush: Hi Mariana - Thank you - yes the blue skies are always wonderful out ther in Feb and Marhc especially. @Larry Elkins: Thanks Larry...I love your images yesterday and today...take care sir! So incredible with all those shapes fighting for attention. Beautiful image. @Phil D. Morris: Hi Phil - Thank you sir! Very interesting plants and rocks. The quartz veins are cool. @Steve Rice: Hi Steve - yes they are fascinating...there are so many wonderful things about that Park! @john4jack: Hey Jack - thank you sir!! That amazingly blue sky just pops right out at ya! Great shot!!!! @Julie: Yes it does even when you are there...thanks Julie!! I love the deep shadows that make the rock on the left have such a unique shape. I will still remember the strong smell of creosote in the air after a desert downpour and in he morning, too. Nothing like that smell. Beautiful! I love the colors and details. Nice joshua tree, too! Hi again, Yes -- you are absolutey right about Senor Wences and his hand-drawn character. Ha. I can really see it now. You and your imagination!! Love it!! @peggy n: I owe it all to youPegs!! Love you guys! And thank you dearie! Beautiful colors captured here. And it's interesting to note how straight those veins of quartz are.